Advertising your company is important, it helps to drive in business. The better quality products and the better quality artwork, the better the chances of gaining a new customer. When advertising, the options are limitless. Whether it’s business cards, vehicle magnets, refrigerator magnets, lawn signs, flyers, the list goes on and on, Let It Ride Design can hook you up. 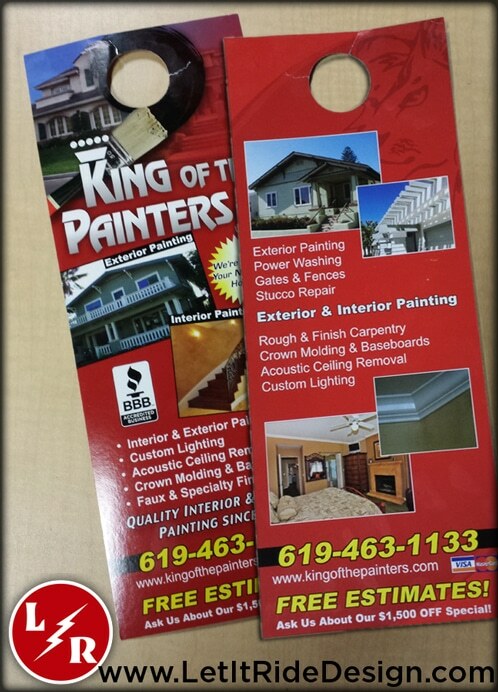 One of our repeat clients, King of the Painters, came to us to create custom door hangers for their business. They came to us with their old designs and asked us to make enhance it and make it stand out more. The hangers themselves were a thicker card stock to withstand any weather or beating this treacherous San Diego environment would put these through. The hangers were 4.25″X 11″ Die Cut Door Hangers on 16PT card stock with a UV coating. Our door hangers can have either an arch die cut, standard die cut or a starburst die cut, whichever you prefer. Halloween is around the corner which means costumes and parties. Whether you need invitations, a custom costume idea, shot glasses, pint glasses, napkins or banners, Let It Ride Design can help. Have an idea but no artwork? We can help you there too! Shoot us an email with your needs and we’ll get you taken care of.